PHOENIX — The Arizona Game and Fish Department is accepting applications for leftover hunt permit-tags for the 2018 sandhill crane season. A list of the 14 leftover hunt permit-tags — eight for youth-only hunters, five for archery-only hunters, and one for the general season hunt Nov. 28-30 in Game Management Unit 28 — is available online at https://www.azgfd.com/Hunting/Regulations/. Applications are being accepted by mail only on a first-come, first-served basis at the following address: Arizona Game and Fish Department, Attn. : Draw/First Come, 5000 W. Carefree Highway, Phoenix, AZ 85086. 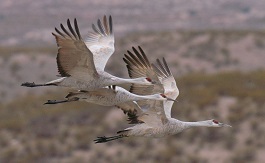 The 2018 Arizona Sandhill Crane Regulations are posted online at https://www.azgfd.com/Hunting/Regulations/. For more information, call (602) 942-3000.